Happy Wednesday, everyone!! I am SO excited that fall is finally here and we can pull out our cozy, chunky sweaters and layer our outfits! 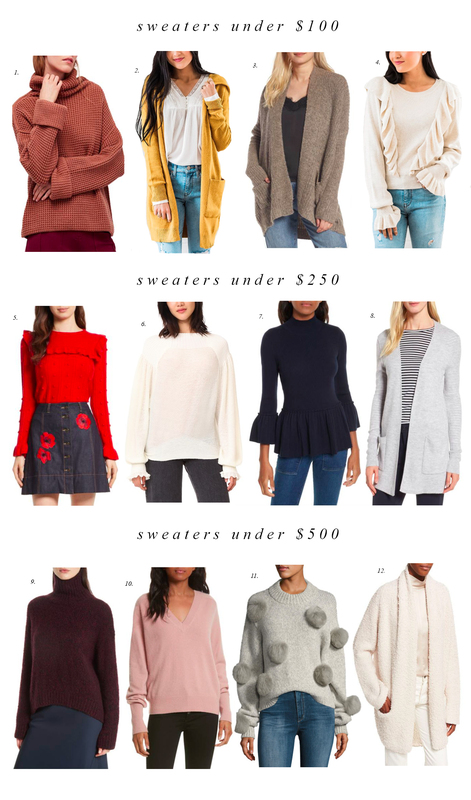 Today I decided to share a few of my favorite sweaters at a variety of price points. I own #3 in ivory (you might remember it from this post) and #6 (last seen in this post and the pink color in this post). And #2 and #4 are part of The Everyday Shop now available at rachelparcell.com! I also just ordered #11 and can’t wait for it to get here! Which sweaters are your favorite?! YAS! Sweaters are extremely great for the cold season! Love these sweaters!So many cozy and chic options! These are all so cute! I am so happy that it is sweater season! These are all so fun! I can’t wait for it to cool down a bit here in Atlanta so I can break out all my sweaters! You can’t have enough cozy sweaters for the fall! I love the sweaters that are part of your new line that are featured here – very pretty and affordable. The gray one with the fur pom poms is also really fun! Will you be restocking #4 in a small? We hope to! Keep checking the site and sign up for the newsletter for all updates! I Love the top row! The waffle knit and that ruffled sweater are SO cute. Love love love when it’s time to pull out the chunky cozy sweaters! Great picks! I feel the same!! I just moved to the South of France this summer and finally the temperatures here have started cooling down and I bought the most luxurious Burgundy sweater to wear in the chilly mornings! I love fall!! Love the sweaters with the bell sleeves and of course the oversized cardigans! Their my faves!